In November of 2010 the team at Custom SLR launched the C-Loop Camera Mount. Having never launched a project before they quickly realized that their friends and family would not be enough to fund their project. They got to work making lists of blogs and websites they thought might be interested in their project. Starting with smaller sites they worked their way up to bigger blogs. Eventually it was picked up by Engadge and their project took off. Posted on March 28, 2013 March 28, 2013 Categories InterviewsTags Audience, Momentum, Promotion, Strategy, Video1 Comment on C-Loop Camera Mount: How to use blogs to build momentum for your campaign. Glif an iPhone Tripod Mount: The design project that started a revolution. In October of 2011 Dan Provost & Tom Gerhardt launched a design project that would spark a revolution. 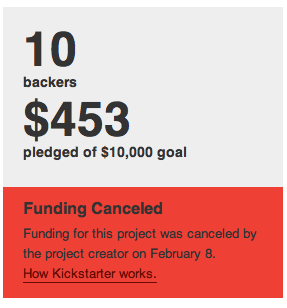 Almost anyone who has done a project design project on Kickstarter has heard of the Glif. So, I had to sit down with Dan Provost to talk about what lead to their success. Besides having what they thought was a solid product idea, Dan & Tom got a plug from a high profile blogger. Of course it wasn’t that simple. In this interview Dan talks about how his existing relationship with this blogger was the key to getting his project picked up. Posted on March 26, 2013 March 27, 2013 Categories InterviewsTags Audience, Campaign, Execution, Momentum, Pitch, PromotionLeave a comment on Glif an iPhone Tripod Mount: The design project that started a revolution. Capture Camera Clip System: The perfect mix of product and passion. In May of 2011 Peter Dering launched a wildly successful design project to being production on his Capture Clip System. In this interview we talk about how a single tweet from someone on twitter sent his project skyrocketing. More then just a cool product, Peter’s project shows us what happens when someone who loves what they are doing shares their idea with the world. He put in A LOT of up front work but it all paid off in the end. Posted on March 21, 2013 March 21, 2013 Categories InterviewsTags Audience, Execution, Kickstarter, Launch, Pitch, Strategy1 Comment on Capture Camera Clip System: The perfect mix of product and passion. In July of 2011 David Greelish set out to revive an old computer history “zine” called Historically Brewed. I sat down with David to talk about his thoughts on Kickstarter, and why I thought he had the perfect project for first timers. David had small but interested following, and hosted a podcast about historical computing. He pick a reasonable goal and project. All of these factors allowed him to easily hit his goal and almost triple it. You launch your Kickstarter project, email family, post it to Facebook, share it on Twitter, and then what? When running a campaign you quickly release that there aren’t as many ways to market your project as you thought. That’s exactly what happened to Susan Tinkham and Kyle Turgeon when they launched a campaign for their short film Figments of a Father. Instead of sending out more email blasts they decided to get creative and reach out to there local community to help promote this project. Susan shared with me how they created signs, fylers, when door to door, and generally “made a fool of themselves” all in the name of promoting their project. Now that you have an idea of who your audience is, it is time to start interacting with them. I highly recommend reaching out to your audience well before your project begins. That way you, are part of the community and not some stranger trying to make a fast buck. Of course that’s not what you’re trying to do, but if the audience doesn’t know you, it might come off that way. If you’re passionate about the subject matter, chances are you’re already part of an online community. If not, now is the time to start looking. Look for any blog, podcasts, online video shows, forums, or social networks related to your subject matter. Start joining these online communities and try to get a sense of what they’re all about. You don’t have to contribute right away, but you can if you want. The important thing is to try to understand what the culture of each community is. When you feel comfortable, start interacting and talking to people about your project. You’re not trying to sell it to them, you’re just trying to get their feedback. If you want to learn more about how to reach out to online communities effectively, I recommend Gary Vaynerchuk’s book Crush It. He is one of the best online marketers and is great at interacting with communities to build an audience. Do you know anyone off-line that is interested in your subject matter? Ask them what communities they are part of. You can also ask them if they are willing to help promote your idea. Even though Kickstarter is built to spread ideas online, don’t be afraid to reach out to people off-line. The combination can be very powerful. Off-line contacts will probably communicate very differently from online contacts. They may send private e-mails and messages to their friends. Those personal forms of communication can be very powerful when trying to recruit support for an idea. With some projects, talking about your idea early may not be possible. For example, if you’re making a product in a very competitive space, you might not feel comfortable about telling people the details of your project. That’s okay, but you should still become part of these communities. Maybe you can help in other ways such as giving advice or posting useful links. Do whatever you can to be helpful to others, so when the time comes, they may be willing to help you. Posted on November 25, 2011 December 5, 2012 Categories Doing Your HomeworkTags Audience, Engagement, Execution, KSG, Promotion, Strategy17 Comments on Where is Your Audience? Now it’s time to really think about your audience. It will be made up of people from various niche audiences, whose interests are similar to the subject matter of your project. Think about all the different groups of people that might be interested in your project. I do not mean the demographic or any other generic marketing term. I do not mean people who like photography or paintings or any other genre of art. Who is the specific subset of people that are going to LOVE your project? The more specific, the better. The hard part about defining your audience is that you might not be entirely sure who is going to like your project. That is why you are really going to need to do your homework. You need to have at least one group of people in mind that the project might appeal to. Ultimately the more niches you can target, the better your chances will be. If you keep targeting the same people they will get tired of hearing about it. People are going to like it or not. Sending it to them more often probably won’t change that. If you are lucky, your project may even appeal to people you had not thought of. However, failing to identify potential groups before your launch will make reaching your goal extremely hard. It’s OK to have some unexpected support, but it’s risky to leave everything up to chance. Posted on November 23, 2011 December 5, 2012 Categories Doing Your HomeworkTags Audience, Engagement, Execution, KSG, Promotion, Strategy19 Comments on Who is Your Audience?